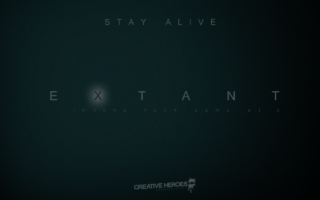 Extant is a free-roaming survival audio game, completely based on sound. We released a tech demo for Extant in October 2010, a few days prior to Halloween. The demo allows players to wander freely through an atmospheric, monster-infested world, exploring sites and buildings while fighting off zombies and collecting pickups such as ammo and medicine. Extant is based on concepts developed back in 2002 for an audio game prototype named “Dark – A Garden Wander”, created by Sander Huiberts, Richard van Tol and Hugo Verweij. One example of such a concept is Moby, the protagonists dog, who can guide the player to certain areas and objects using an innovative command menu. Through this tech demo we explore the design possibilities of an audio-only game space that is intuitive, immersive and easy to navigate. We found that a space based on spheres meets such requirements best. For example, players wander around on a spherical-shaped world, in a fashion similar to Mario on a small planet in Super Mario Galaxy. This approach frees designers from having to add spatial obstructions in order to constrain the players’ free movement to a specific area. Spatial obstructions can be quite a design challenge in audio games, since walls are usually silent and one does not want the player to constantly bump into them. Each building and site is circular as well, allowing the player to enter from any direction.